However, watching an underdog story wouldn’t be the same if you didn’t get to know the characters behind the story. Of course, there would be five very different personalities. The story would revolve around how the two Dunwell brothers keep the group on track: Joseph on vocals and guitar with his pensive intensity and focus, and vocalist and guitarist David with his mega-watt smile and open nature. Together they would form the initial core of their band. The documentary would show how David Dunwell met his friend Rob Clayton, who with his wise words and innate sense of style would eventually become the bassist. Realizing that more members were necessary, Rob Clayton would introduce his own cousin, Jonny Lamb, to the Dunwell brothers, with Jonny eventually taking on the role of the drummer. Jonny’s jovial character and warm energy would allow him to diffuse group tension. Soon thereafter they would meet David Hanson, a character with a knack for challenging the norm and funneling that same fervor into his lead guitar solos. While the accurateness of my character descriptions remains officially unverified, the facts regarding their rise to fame are authentic. Isn’t this a story where you would want to find out what happens next for a group poised on becoming the next big thing in British Folk-Rock? I met with the Dunwells following their first EFMF workshop on the weekend and they provided a glimpse into their recent rise to fame. The round table discussion showcased their dynamic as a group. Sable: How was your first workshop session at the EFMF? Joseph Dunwell: That was a lot fun. We didn’t know what to expect with the three bands on stage but that was a lot of fun. David Dunwell: We’ve never done that before—where each bands takes a turn and plays. It was nice. I’ve only ever seen that on T.V. on Jools Holland. Sable: Did anyone warn you about the format? Group: That was the first we heard of it! David Dunwell: We’ve always wanted to play Canada and to come to such friendly festival like this as our first experience, that made it pretty special for us. Sable: At one point, you performed 40 shows in 20 days. How is that process? Joseph Dunwell: You learn a lot about yourselves, you know, and the music that you play and how to perform to different sets of crowds and how to adapt to different situations. David Dunwell: Some of the shows were plugged in PA systems. Some of the shows were purely acoustic. Small rooms, large rooms, we were crammed in a small van together travelling up and down the UK so there’s no escaping each other. It definitely taught us how to be a band, especially a touring band. Joseph Dunwell: So now we can just walk into a room with no expectation. We just know whatever is thrown at us we can deal with… like, for example today, that was good. Sable: Has the recent burst of media attention changed the way you approach your music or performances? David Dunwell: You’re kinda in the eye of the storm. Although these amazing things are all happening around us, we’re still just five friends making music exactly the same as when we started out in the first place. Personally, I don’t really notice a big huge change. We just enjoy doing what we do. Jonny Lamb: It hasn’t really changed the way we make music or anything like that. Say Joe comes up with an idea, and then the rest of the guys jump on it, and we have a jam and see what happens. But that’s always been the same. David Hanson: I think the best thing about touring in America is the diversity of the radio. We spend a lot of time on the road: 16 hour, 12 hour journeys, so we listen to a lot of radio stations and there is such a wide variety of music, which you don’t really have access to in the UK, unless you go on the internet to find it. It’s so readily available in the States and in Canada. So for us, although [the media] is not influencing us, it is very interesting listening to [the radio] and I suppose, subconsciously, it may be influencing us. Joseph Dunwell: It definitely is. Do you know when you’re growing up and your parents have their music in the background? That somehow influences the way that you play music. Being in the band and listening to the radio while we’re on the road is definitely influencing the way that we write songs, but the five of us are still open to put our input into it. Sable: What does the songwriting process look like with so many different viewpoints in the band? Joseph Dunwell: Every song is different. Some songs are written by three of us, some are written by five of us, some songs are written by one of us. David Dunwell: Some songs are a riff that hangs around for a long time and never goes any further until, suddenly, it becomes something we all focus on. Joseph Dunwell: The thing is that we never [leave a song unfinished]. We always play every song live at least once. Sable: Do you ever scrap songs after playing them live? Joseph Dunwell: Many a time. Jonny Lamb: In some cases, we keep it in mind and then we come back to it and play it in a different way than the first time we tried it. We never throw anything away. It’s always there. David Hanson: We’ve been playing a lot of 90-minute sets on this tour because we’ve been doing more headlining shows. It’s given us a chance to experiment with new material. Maybe it’s an old song that’s been hanging around for a while or maybe it’s something new that we’ve been writing on the road. But it just gives us that chance to test it out. A long set is almost like a litmus paper. It allows us to experiment and find out whether [songs] are going to be acidic or alkaline. Sable: What are your thoughts on people labelling your sound or comparing your sound to others groups like Mumford and Sons? David Dunwell: I’m a fan of a lot of the bands that we get compared to so it doesn’t ever offend me. We class ourselves as British Folk-Rock. We call it Folk Rock because we like story telling. We use traditional instruments and mix it with rock and roll instruments as well. David Hanson: We call it rock because we play really loud. Joseph Dunwell: Do you know what? Everything has to have a label. In what we’ve been living with we don’t resent it. David Hanson: Are we a rock band? Are we a pop band? Are we a folk band? I don’t know. We have been labeled, but if someone were to ask us what we do: we play songs and we enjoy playing songs. Sable: How do you intend to keep the momentum of the band going into the future? Joseph Dunwell: We’ve just got to keep touring, you know? We see things happening a lot more when we’re on the road. When we go home we think, “is that it?” and we’re so ready to go back on the road all the time. It’s hard work but it’s good fun. And we’re leading our own path into our own future by touring and doing what we’re doing to every corner of the world. David Hanson: Our album comes out on August 28. 2012, it’s called “Blind Sighted Faith,” and in support of that our plan will be to tour and we’ll be continuing our US tour to late September, at which point we’ll return to the UK. The album comes out in the UK around that time. Then we’ll be heading back over to America sometime in October and touring up there with different artists and we’ll be doing festivals like the Austin City Limits Festival and hopefully some T.V. as well. Sable: You’ve busked and even moved your concert to a hotel after getting rained out at Lollapalooza. Does venue environment change your performance experience? Joseph Dunwell: As long as I get a vibe from the audience that they’re enjoying themselves, then I am enjoying myself, you know? So if we’re playing an acoustic song and it’s so silent that you can tell that they’re really into it or we’re playing the loudest song in our set… as long as I’m getting something from them I’m happy. Rob Clayton: As long as you’re enjoying what you’re doing, it’s going to be fun. Sable: If you weren’t doing this, what would you be doing? Jonny Lamb: I’d be a tractor. Rob Clayton: A tractor? Not a driver? A tractor? David Hanson: An attractor of ladies? Jonny Lamb: No, no, a tractor, like a farm tool. Rob Clayton: I’m not gonna even follow that. David Hanson: I’d be a fly. Jonny Lamb: That’s a living thing, not an object. David Hanson: On a wall, it’s an object! Sable: What is the most rewarding thing about being an artist? Rob Clayton: To me, personally, it’s crowd feedback. When we you see everybody loving what you’re doing it keeps you going, especially when you’re on the road. You can be exhausted and feeling a little bit down, and then as soon as you do a show that evening, you’re just back up there again and loving what you’re doing. To me it’s all about the vibe from the crowd and that is the most rewarding thing. David Dunwell: For me it’s travelling, meeting new people, and having the opportunity to travel the world. I remember going on holidays when I was a kid if I was in Paris or wherever, and I’d be watching a band, I’d go “Oh gosh, I wish I could do that!” Now I get to travel the world and be on a stage making music and I’m meeting new people everyday. Sable: Was there a moment when you realized that this wasn’t just a jam band and had the potential to go somewhere? Joseph Dunwell: I think the moment I actually got our first album. It comes out on the 28th of August, but we’ve been given a hard copy now, so actually holding that in my hand for the first time and having copyright and all this stuff I see on real albums. And now we have one of them! David Dunwell: You just like the picture of yourself on the front cover. Joseph Dunwell: So yeah, the fact that we have our first album. It’s something that I’m proud of and looking forward to getting out there and selling. David Dunwell: One of the very early shows that we did in London, we traveled down, we were in the van, and about 15 miles out of London the van broke down. We had a decision to make. We were either gonna have to wait for the recovery man to come and pick our van up, and take us to the nearest town to fix our van and miss the show. We decided to book a taxi and struggle to get through London traffic and leave the van at a service station on the M1. We actually got the venue five minutes before we were supposed to go on stage. We walked onto the stage and played in front of four or five people. We made all the effort to get there and play for four or five people. But one of those people was a promoter who adored us, Tony Moore; he used to play in a band called the Cutting Crew. He championed us so much that he made me believe that our band is worth fighting for. He had seen so many bands coming through, being a London promoter, and for him to have that much faith in us made me think, “yeah, we’re not just a jam band, we’re not just a band floating around the north of England,” but a band that deserves, you know, everything that is good, everything that is bad, whatever that comes to us. Jonny Lamb: [Tony Moore] first suggested to us to come over to America as well and perform at the Folk Alliance Conference, which led to massive things for us. Joseph Dunwell: He’s the guy. Jonny Lamb: Without him really, we’d still be eating fish ‘n chips in Leeds…in the rain. Sable: Is there any country that you would love to tour to as a band? David Hanson: I think Japan would be fantastic. I’d love to go out there. I heard it’s very nice. I heard the crowds are really appreciative of music. I think we’d like to go to mainland Europe and perhaps do France and Germany and places like that. Joseph Dunwell: We did a festival in Amsterdam. We were literally in and out of Amsterdam and then back into the UK and then straight over to America. So we’ve had a snip-bit of Europe but I’d like to go back and experience the whole of Europe. Sable: It’s the musician’s lifestyle. 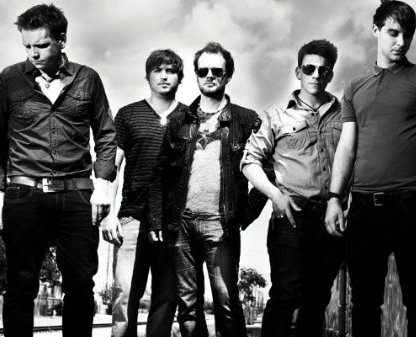 The Dunwells are well on their way to becoming a formidable British Folk-Rock export; however, these five musicians still maintain the ease of five blokes you could approach at your local pub. Hear it for yourself in this lightening round of questions. Who knew that brollies vs. wellies would be such a highly contested issue?